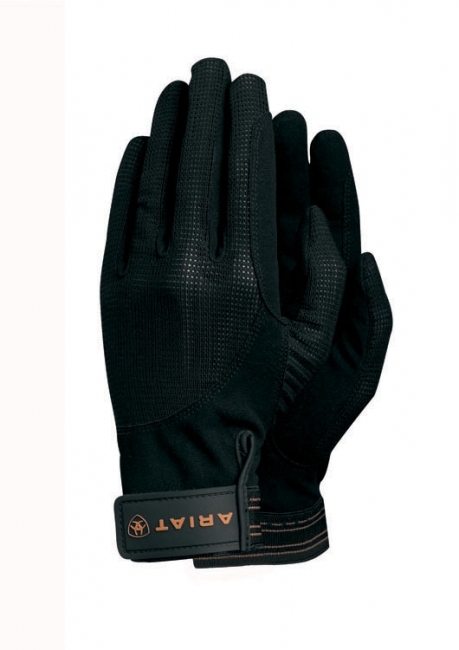 Ariat® Air Grip Gloves are the ultimate riding glove for schooling especially in warmer climates. These gloves have the finest synthetic suede at the palms for exceptional grip and sensativity. The Air Grip gloves are reinforced to reduce the wear and tear from rein contact and have articulated fingers for a smooth, enhanced fit. The stretch mesh on the top of the hand provide maximum breathability, flexibility, and ease of movement. The Ariat® signature non-snag velcro at the wrist makes for easy on/off and an adjustable fit. These gloves are washable. breathability, flexibility and superior fit.